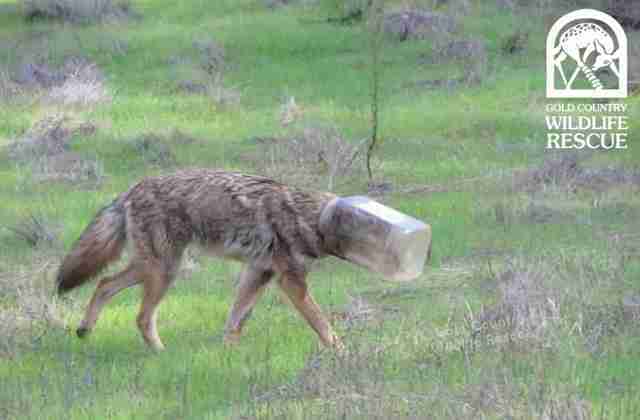 For almost two weeks, worried residents in Cool, California, watched as a coyote navigated their yards wearing a rather strange object on her head: a large plastic jar. The coyote, a young female, was spotted in late January with the jar around her head, leaving only a tiny gap near her neck that allowed her to breathe. 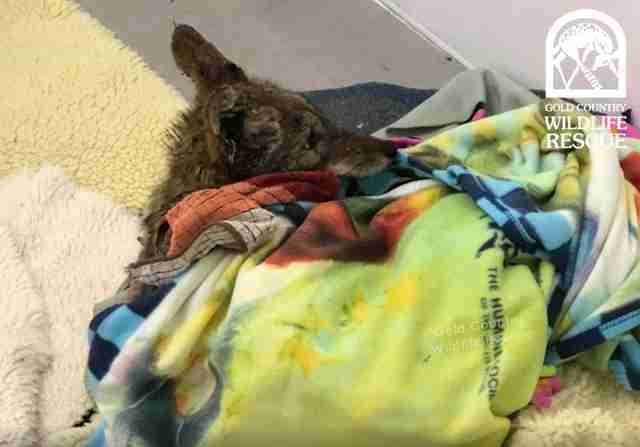 Homeowners helped Gold Country Wildlife Rescue keep tabs on her. 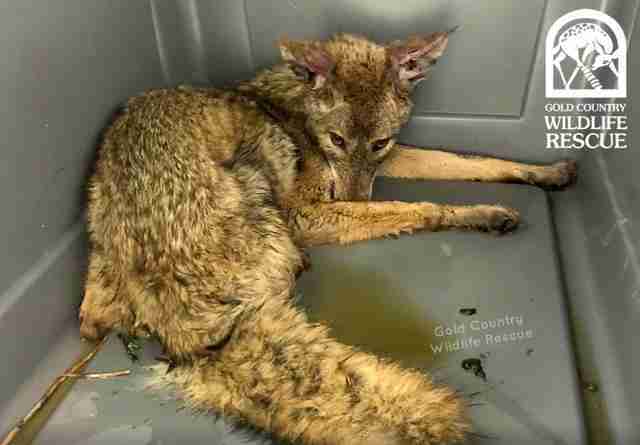 But while it was clear she was growing weaker and weaker every day since she was unable to eat, the coyote still managed to keep out of rescuers’ grasps. Rescuers set traps, staked out the woods with a net gun and patrolled areas where she’d been spotted — and after 10 days, they finally managed to catch her. Unfortunately, cases like this aren’t uncommon. Many people throw out jars or plastic containers with food still on them, which leads curious animals to stick their heads in — and often, get stuck. If they aren’t spotted in time, it can be a death sentence. Fortunately, this coyote was found just in time — thanks to all the homeowners and rescuers who cared about getting her help. She’s currently in recovery at the rescue’s facility, where she’s receiving fluids and multiple small meals per day to help her regain strength and weight. She also tested positive for a tick-borne disease, so she’ll be on medicine for the next two weeks. “In the past week we’ve had her, she’s progressed from having a few tablespoons per day to much larger meals,” Stein said. As licensed wildlife rehabilitators, Stein and her team have minimal direct contact with the coyote to ensure she doesn’t become used to humans. She is being fed and administered medicine through a visual barrier, and is monitored through a camera placed within her quarantine kennel. And since she’s feeling better now, the coyote isn’t afraid to show off her feistiness to her rescuers. Since the coyote is still very thin, Stein expects she’ll be ready to be returned to the wild within four weeks. But until then, weight gain is the main goal. While it’s good news that the coyote is safe now, Stein said the best way to stop other animals from getting into these situations is to dispose of your trash in a secure bin. When dealing with jars with lids, she suggests putting the lid back on or washing out the container prior to throwing away to deter curious animals from putting their noses inside in search of food. 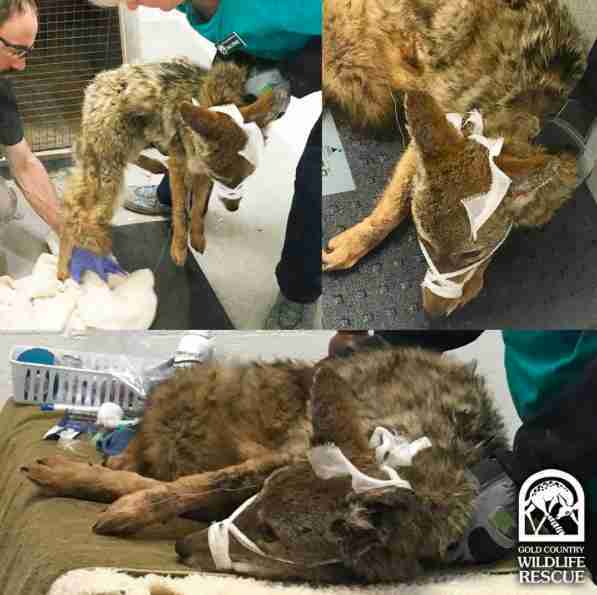 To support the coyote’s medical costs, you can make a donation to Gold Country Wildlife Rescue. 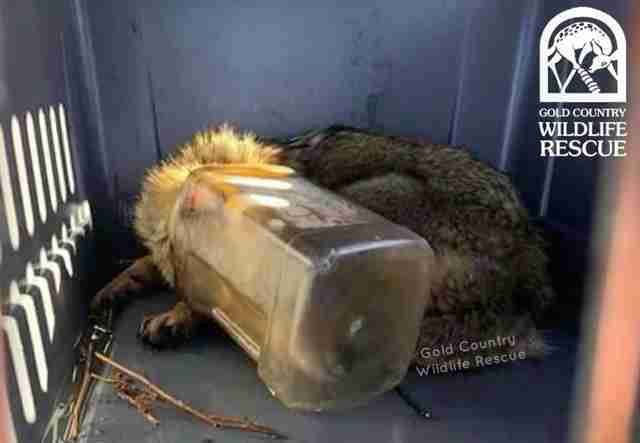 If you ever find an animal stuck in trash, contact a licensed wildlife rehabilitator in your area immediately.